This just in! 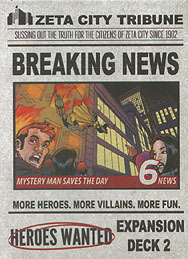 Breaking News is a new expansion pack of Hero, Villain, and Quirk cards - fifty-four in all - that further amplifies the legendary qualities, invasive evil, and seat-of-your-pants thrills of Heroes Wanted by bringing more POW! to you powers with the pack's focus on actions and action types. This is not a standalone game. Intended for use with Heroes Wanted.